Most cases occur in rural communities in sub-Saharan Africa. Nearly half of people affected in Africa are children under the age of 15. HIV infection is not a risk factor but it weakens the immune system, making the progress of BU more aggressive. 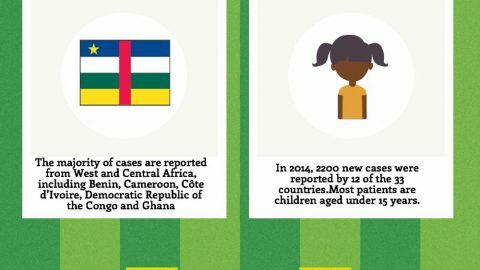 West Africa (Benin, Côte d’Ivoire and Ghana) report most cases with Côte d’Ivoire reporting almost half of the global cases. Africa with more than 80 000 cumulative cases has around 99% of the global burden of BU. Approximately 80% of cases that are detected early can be cured with a combination of two antibiotics, recommended by the AHO (rifampicin with streptomycin or clarithromycin).